Our initial program for recruiting new members ended on March 31 and we were able to add 10 new memberships to our club! That offer was aimed at the general public and offered a 12 month membership for the price of 9 months when paid in advance. Pretty good for a first effort. Now it’s your turn. Between April 1, 2017 and June 30, 2017 any member who brings in a new member will receive a quarter free of dues. Once the new member has paid for a year, whether on the pay in advance and waive the $500 initiation fee, or the normal monthly or quarterly payment option; the referring member will get 3 months free of dues. Our recent survey shows that current members give us high ratings for “value for membership cost” so why not share the experience with your friends and relatives? We need new members to keep our dues low so let’s unleash the awesome power of the NCCC members and see what we can accomplish. 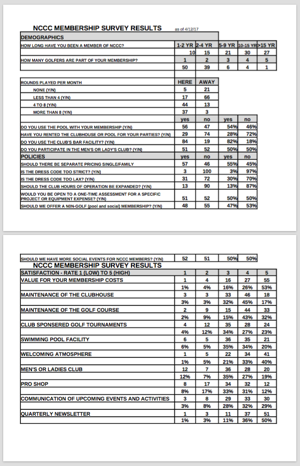 Results are in from our recent Membership Survey. Thanks to the 103 respondents for your input and feedback. We will use this information to guide us in areas needing work and/or those most important to you. Dave Boynton is moving to Montana and has stepped down from the Board of Directors for NCCC. Sandy Pack has agreed to serve on the board for the remainder of Dave’s term. We thank Dave for his service and wish him the best of luck in the frigid north. We also thank and welcome Sandy for her willingness to serve despite her prior commitments to the Ladies Club and their events. Trees are an important asset to any golf course and they are particularly important to our club. In addition to the need to replace our dead trees we would like to add more trees along the longer fairways on the course. Peter Chow maintains a list of those species that are best matched to our environment. If you would like to donate a tree to the course, either in memory of someone or just because you’d like more trees, let the staff know at the front desk. We will keep a list of these donors and let you know when it’s your turn.